A web portal is nothing but a website designed in a special way to accumulate information from various sources into one platform. It gathers information from emails, online forums, search engines and many more and displays all of those details on a single page. You can find a variety of information on any web portal such as articles, products, vendors, suppliers, individuals, etc. You need to create your own account by logging into the web portal to view those details on your own profile. It differs from a typical website in the fact that it is dynamic in nature and offers personalized information to portal members. There are different types of web portals available in the market such as government portals, corporate portals, search portals, etc. Financial companies, brokers and online bidding agencies develop respective web portals to maximize their sales and business volume. If your business falls into any of these categories, you can develop an exclusive web portal by connecting with our experts. Call us, email us or chat with us to reach our professionals at UAE Technician and avail web portal development services at a budget-friendly price. A business having an active website can convert it into a dynamic web portal by connecting with experienced providers. Our team of experts can help you in the best manner to develop a catchy web portal for your business at a reasonable price. Wondering how to build an attractive web portal to increase your business volume? Relax! Our experts at UAE Technician can meet all requirements at an affordable price. We are the best service provider to offer web portal development in Dubai at the least possible price. 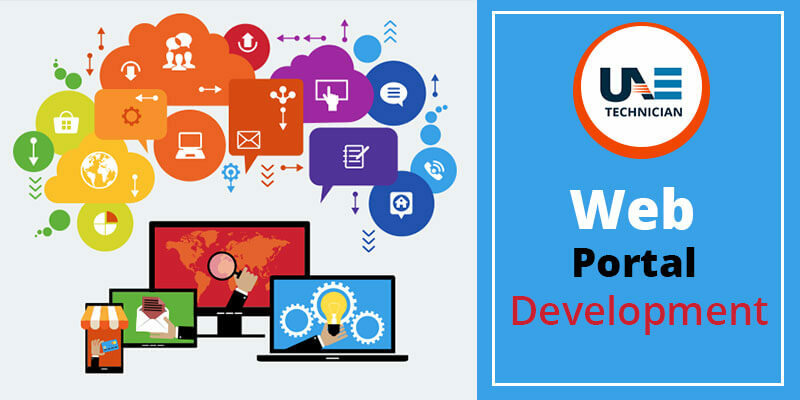 Our developers have years of experience in developing thousands of web portals for various sectors. Additionally, we analyze the customer’s requirement thoroughly and then start our service to generate the best result. We want to increase your website’s acceptance and offer you a high conversion rate of buyers into customers. Besides, we are aware of the techniques which can make your online store look unique and attractive. Let us know about your concerns and get 100% assured services. Dial our helpline number: 042053349 to get connected with our professionals at UAE Technician. We are available throughout the day to provide assistance at the time of need. Additionally, you can drop a mail to us and receive assistance through a call back within the next 24 hours. You can talk to our professionals in real-time via live chat and avail web portal development in Dubai at a reasonable price. We also provide health care portal development service in Dubai.